New for 2016, Sig Sauer launches a new line of very high quality tactical riflescopes, with the features and design that modern shooter demand. We will feature the Tango6 and Tango4 series. FREE CUSTOM SBT™ WITH EVERY TANGO PURCHASE. With our SBT™ system, you can dial-in the exact shooting range of your target and hold the reticle directly on point-of-aim for unmatched accuracy on every shot you take. Pinpoint precision has never been so easy. If your target is at 300 yards, simply adjust the dial to “3” and know you are hitting the mark. 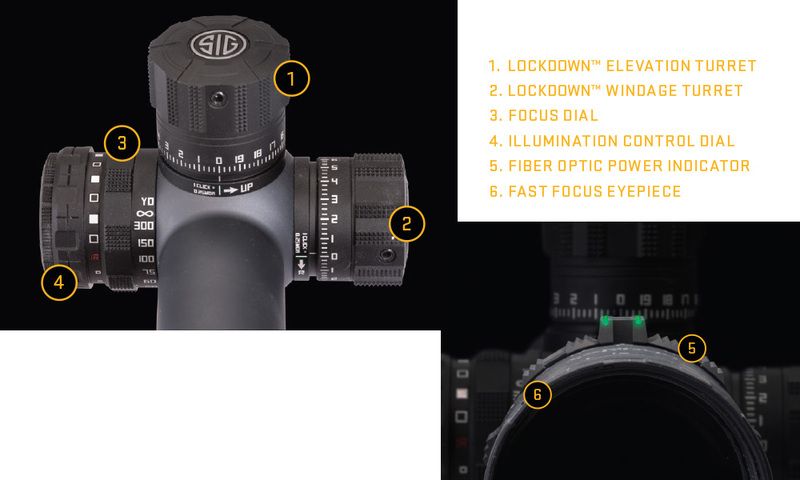 Perfectly matched to the ballistics of your shooting system, the SIG Ballistic Turret (SBT) is a custom, laser-etched elevation dial for your SIG SAUER® Electro-Optics riflescope. Using inputs including bullet specifications, ballistic coefficient, muzzle velocity, elevation and other environmental factors, the SBT system allows for the correct bullet drop compensation and pinpoint accuracy at any range. SBT dials are available on all TANGO model scopes. SIG SAUER Electro-Optics are guaranteed forever. It's an unlimited lifetime guarantee.